The last post I wrote about carpet-eating iguanas was totally off the deep end, I realize that. It’s like I put on a scuba diving mask and submerged myself so deep into the ocean and began writing right there with my waterproof pen and paper. How deep was I? So deep that I saw one of those angler fish. I actually didn’t know this before my trip to the bottom of the ocean, but angler fish actually love to read a good book or a blog even. Why do you think they travel around with a book light? The angler fish I met is working on getting Internet access. He says once he gets that all lined up, he’ll follow me via Google Friend Connect. Anyway, I realize that my last post about a carpet-eating iguana was really quite odd. That is why I decided to shoot it to you straight and to stick with true stories. I suppose if I spent less time reading crazy posts about angler fish written by blogs like The Oatmeal (if angler fish have a tendency to get you giggling, and who doesn’t loooooove a good angler fish joke, you have to check out his article!) and more time reading blogs that are edifying, honest, uplifting and helpful, like TV’s Take, maybe I’d be in better shape! Speaking of TV’s Take, she gave me two blog awards! I have now been recognized as having a versatile and trendy blog. Quit your laughing. I DO cover a range of topics. Does anybody want to talk about Pepto Bismol, tartar sauce, Chinese robots, nutria, gyms, toilets, iguanas or angler fish? As far as trendy goes, I’m not sure if I will inspire anyone to talk about hearing loss or fish needing eyelids, but I still appreciate the recognition! It let’s me know that there are people out there that enjoy reading what I write. I am becoming verklempt, so please excuse me for a minute…. Would you get back here? I know I indicated that I wanted you to talk amongst yourselves, but I didn’t think you were headed out the door. I’m good now. I had to blow my nose and fix my mascara. 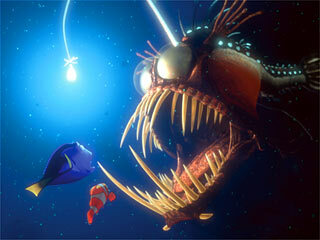 (You should’ve seen my mascara after my ocean outing with that angler fish. I remembered the waterproof pen & paper, but completely forgot about the mascara.) TV’s Take is a breath of fresh air. She likes to get her readers thinking about important issues, like marriage and finding balance in life. She also has a precious little girl! I encourage you to check out her blog here! Part of the deal in receiving these two awards, is to give them away to five other bloggahs. 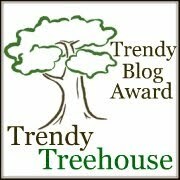 Here are the rules I cut & pasted: “To receive this award, promise to share this with 5 other BLOGS that you think are Trendy too.•Post about your award in your blog.•List your Top 5 Trendy Blogs.•Share with them.•Leave a link to the Trendy Blog Button.•Tell them they need to give this award out to 5 as well”. I enjoy reading many different kinds of blogs- funny, serious, uplifting, educational, funny, inspirational, edifying and funny. Even though it is likely that some of these bloggers to which I have assigned these awards don’t participate in awards, I am lauding them with them anyway! Allie Brosh from Hyperbole and a Half– the girl is big time and has millions of hits to her blog every month. She just started in the Fall of 2009, for cryin’ out loud! Her writing and drawings make me laugh as much as a good angler fish joke. Alicia with It Ain’t Easy Being Cheesy– she is a funny writer, too! I smile every time I read her posts about all kinds of topics. I also love cheese. Lisa with Social-o-logy Invitations & Design– okay, she is my sister, but I honestly think she is very creative and professional! I love all of the invitations and party stuff she has ever made for me. She is super nice, too. Jamie with The Miller’s Big Top Circus– Jamie is a very honest and inspiring writer! Her blog posts make me think about deep topics and laugh, too! Jennifer with Our Hope Endures– Jennifer’s writing is touching and true. I feel like I have been refreshed when leaving something that she has written. She also has uplifting music on her blog that’ll make you want to close your eyes and sway. I’m going to add the angler fish’s blog once he learns how to type.